1. Warm a griddle pan over a high heat. Meanwhile, blend three-quarters of the salad cheese, the dill, vinegar, half of the olive oil, yogurt and garlic in a food processor until smooth. Season and set aside. 2. Brush the salmon and the cut sides of the romaine lettuce with the remaining oil and season. Cook the lettuce on the griddle for 2 minutes, in batches if necessary, without turning. Remove and set aside. 2-3 minutes, until thoroughly cooked. 4. 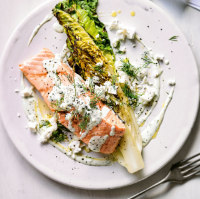 Drizzle the romaine with the dressing, top with the salmon and crumble over the remaining cheese to serve.